Well, the title should say it all. I gave in. Our floors are looking ugly. It started off looking a lot whiter when we 'painted' them. But actually, Jon reminded me, it's not paint it's primer. And it hasn't fared so well. They're a pain to clean, and even when clean, they don't give off that impression. No likes wants to fold clothes or play board games on a floor that looks like this. Okay, the kids don't care, but I do. 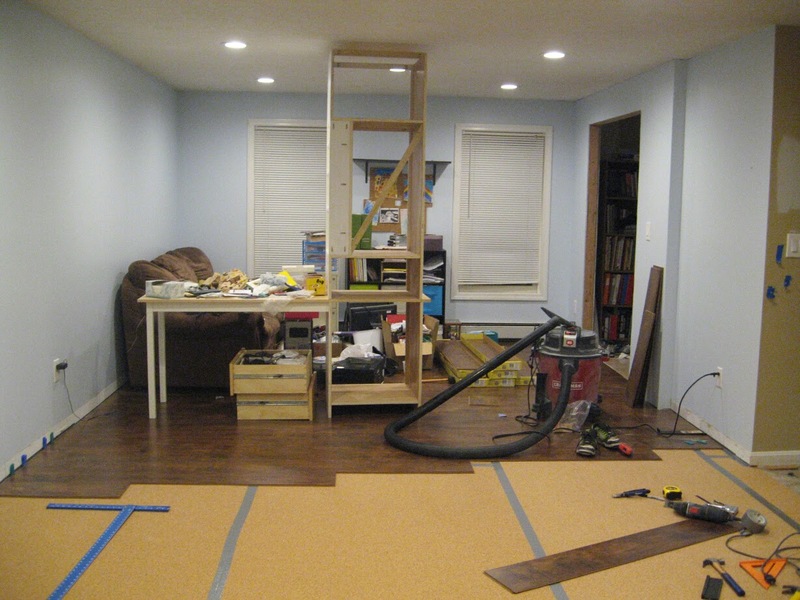 I wanted to just live on painted plywood until it was time to put in some nice, good quality hardwood floors. It's more environmentally friendly to not go through a set of floors we aren't planning on keeping. And it would be economically sound not to waste any money into something we know we won't want long term. But... I gave in. 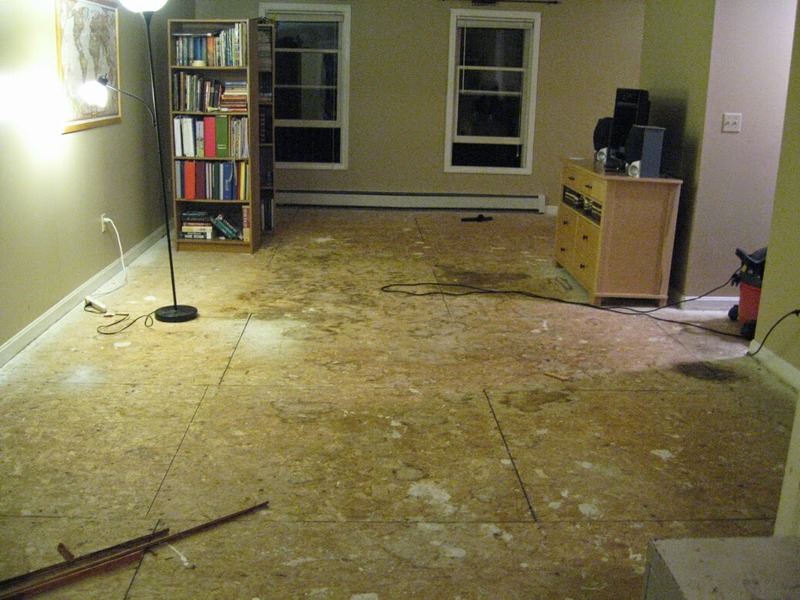 Our car fire wiped out our savings and looking ahead to how many other big repairs actually need to be done to the house.... well, nice floors were looking further and further down the road. And the $0.50/sq foot Home Depot Black Friday deal enticed me. It would only cost $206 in laminate flooring for the whole living room. We practically spent that much upgrading from to a set of five new fancy cordless phones and ceramic cookware on black Friday. (Every person for the last three years that has cooked at our house has commented on how little Teflon was actually left on our cheap Walmart pots and pans.... And our cordless phone actually stopped holding a charge after the power outage.) So it was a year of splurging and upgrading all around. But the floors were a big deal to purchase, mentally. It's hard to go against my original goal and put money towards something that [should hopefully] be temporary. But they won me over. They're not my style, rough scraped Hickory planks (Alameda Hickory) but they look good enough. 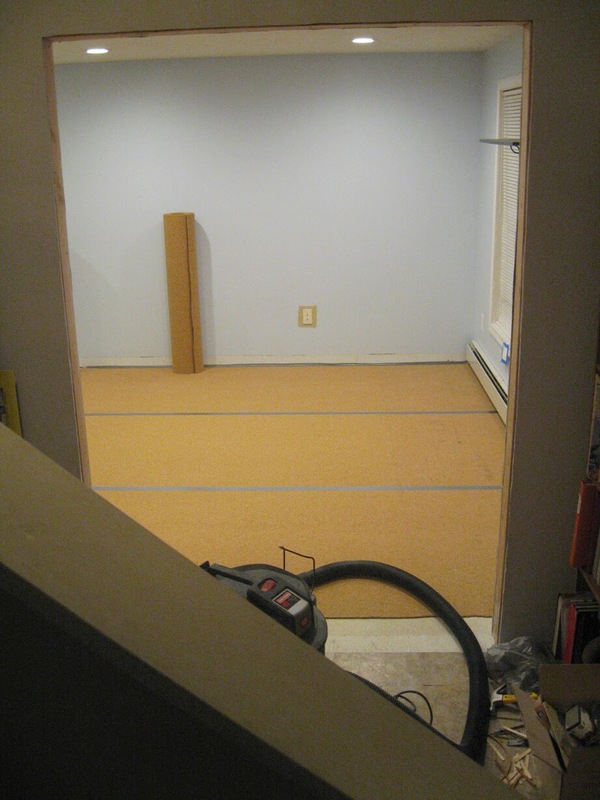 During the week we painted, before I could move the desk and book shelf, we needed to get the haphazardly placed flooring scattered all over over to the finished side of the room. We were running out of room downstairs, for sure. 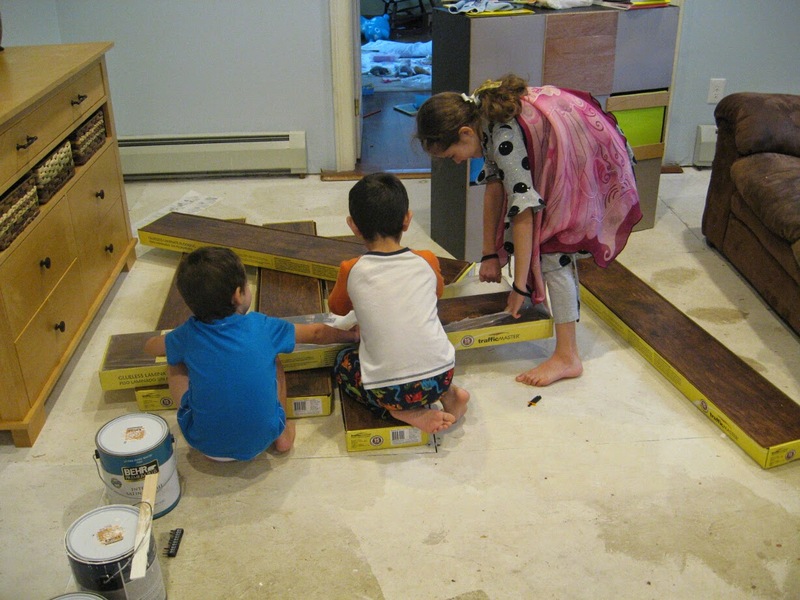 But, as Jon and I were both sick with the flu, our incredible kids did the hard labor for us. They stacked them up, took off the wrapping, and competed for the 'prize'; Being the one to hand me instruction paper on top. 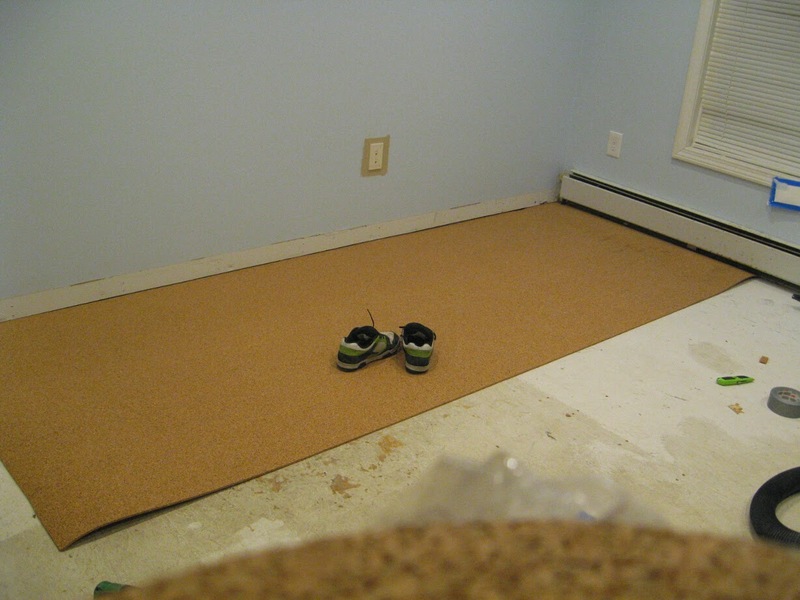 When all was done, we a had a nice neat stack of flooring acclimating to our room, and two really proud parents. We left the last few boxes closed, in case they get returned. 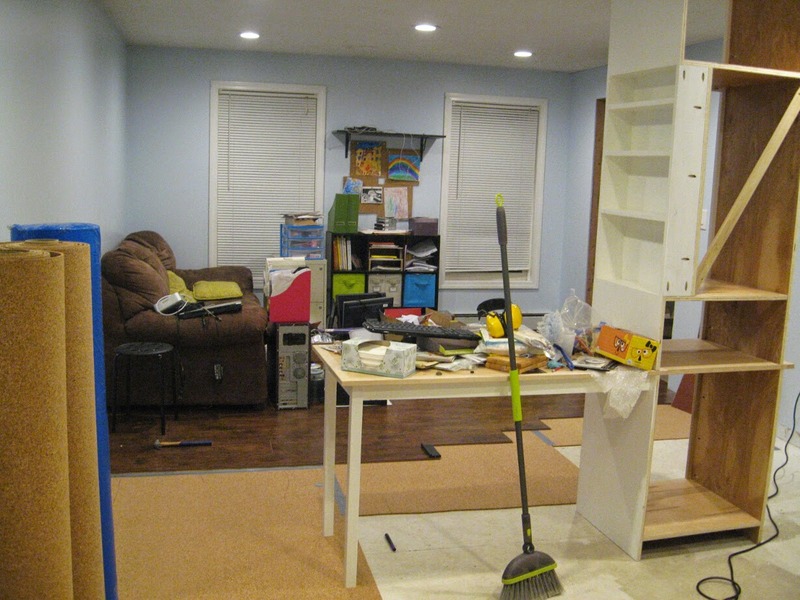 A few days later, it was the weekend again, we moved the bookcases and desk and painted the walls. Now it was time to get those floors in! At this point, after helping so much already, these kids were way more interested in helping than ever before. 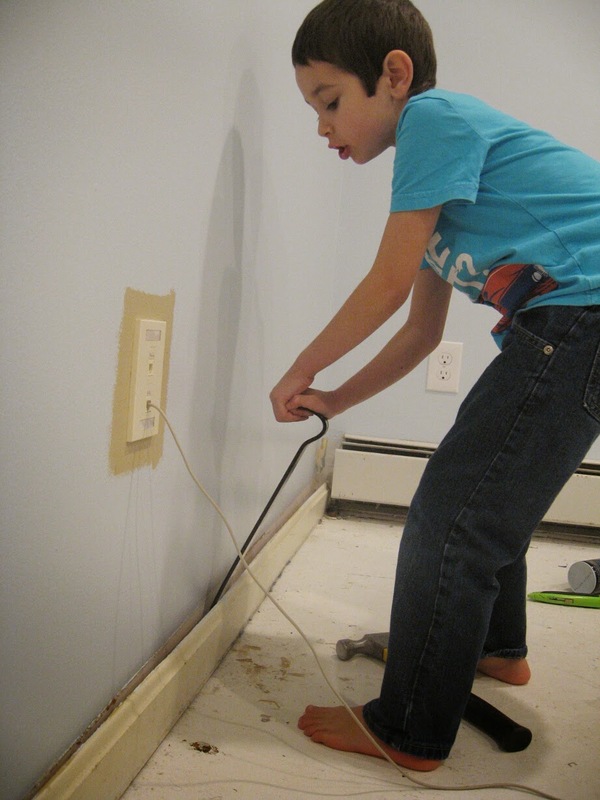 Eli and I worked on peeling the molding off. Thankfully, it all came off easily. 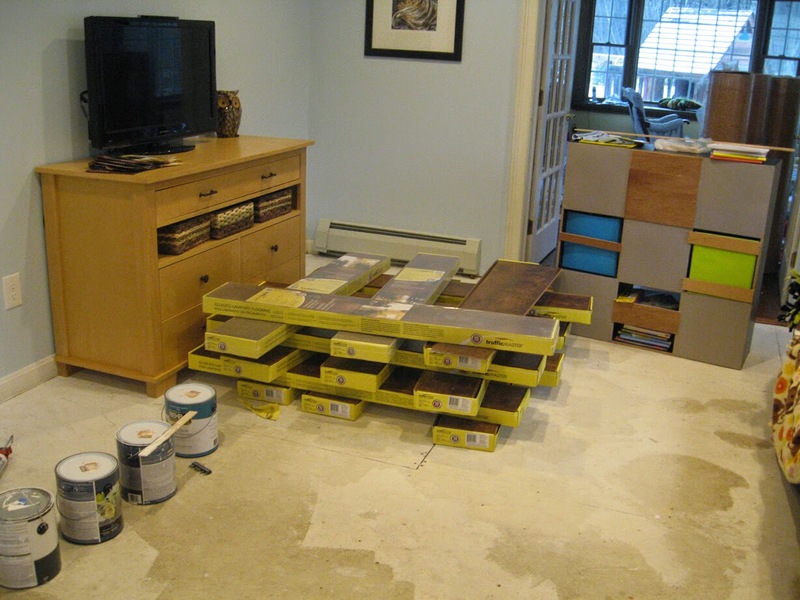 Even more motivation, Eli had requested that he have floors as one of his birthday presents... just a few days away. Then we wrote a few messages and drawings on the floor. We didn't know if anyone would ever see under these floors again, but we figured it was worth doing a little bit of time-capsuling. 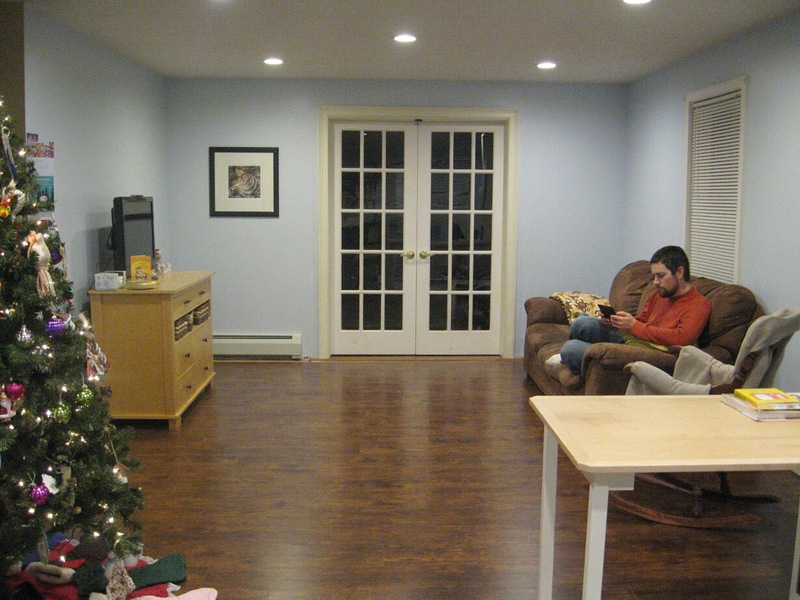 And since we're talking about time, remember that time we installed laminate floors in our apartment? No? Well, that was probably because I didn't blog about it. 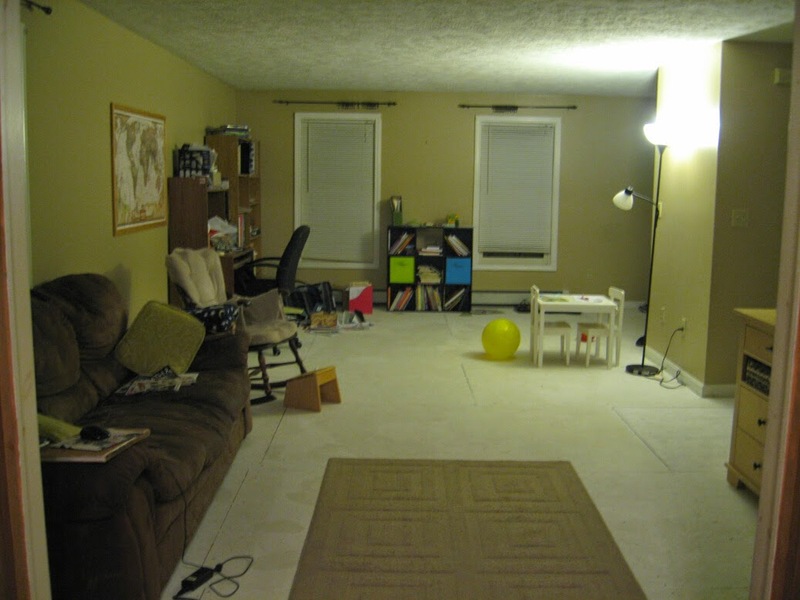 Back in 2009 we rented a place that let us put in laminate floors and get rid of the musty, moldy carpet that was down, in exchange for forgoing the first months rent. Money wise, we came out on top. But it wasn't that fun to do while moving and taking care of a 1 and 3 year old. 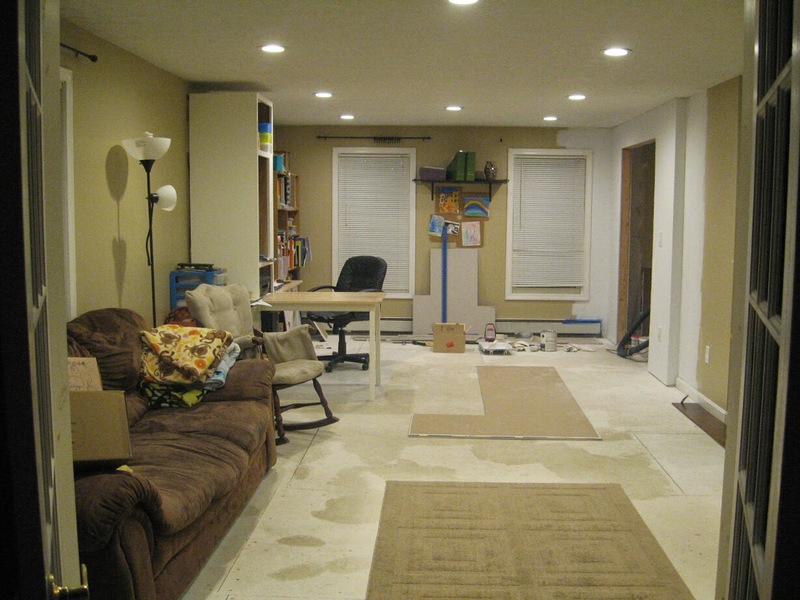 Underlayment! So we went a little different route this time - with cork. 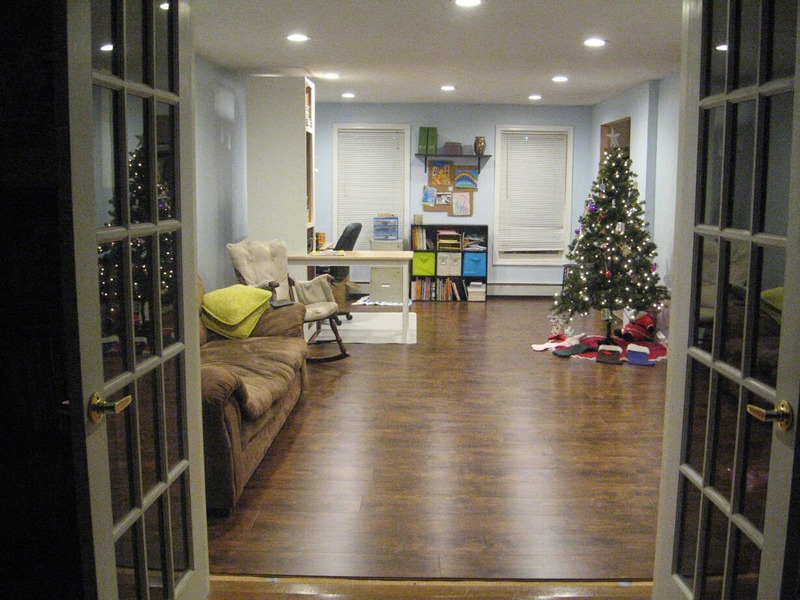 Though the laminate flooring will be temporary, our underlayment is here to stay. 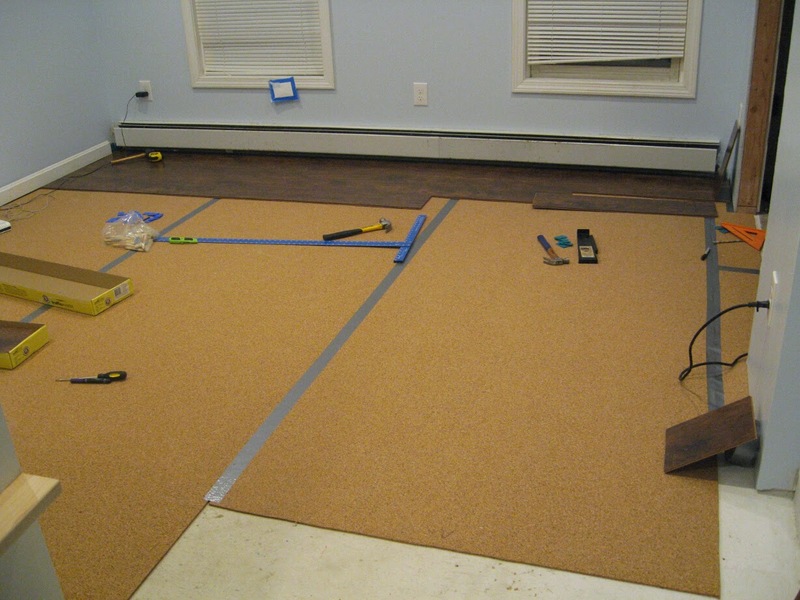 Underlayment is optional for most wood floor installations, but we decided that it would be be nice to have cork under our future nice wood floors. It's really highly reviewed, and had a few benefits. 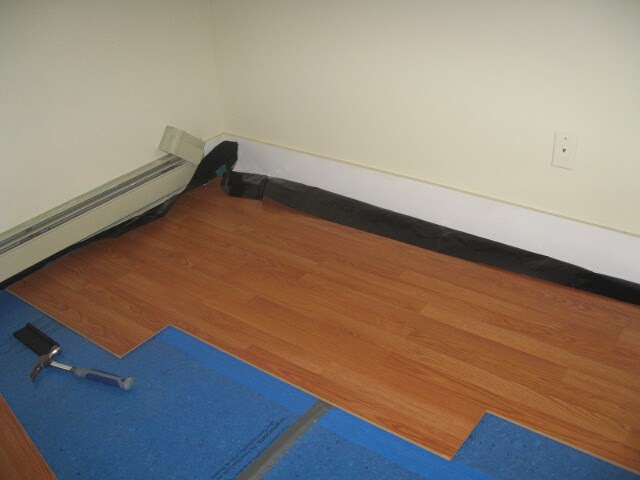 It works out nice because we can install them now and use them to fulfill the necessary underlayment requirement that the laminate floors require, and keep them later. 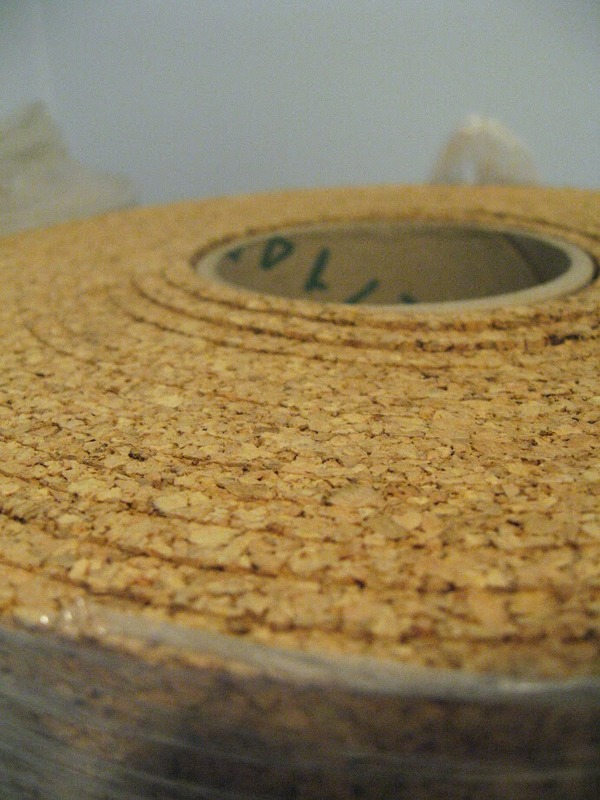 Cork is eco friendly, as it can be harvested without cutting down any trees, and grows back every decade (or so). Cork underlayment is great too, as is it the less dense, sort of 'cork scrap' that the trees produce in the first harvest. As long as cork is profitable, the forests will remain as they stand with no damage to the habitat cutting down the trees. The biggest downside is they do have to be shipped here from the Mediterranean. 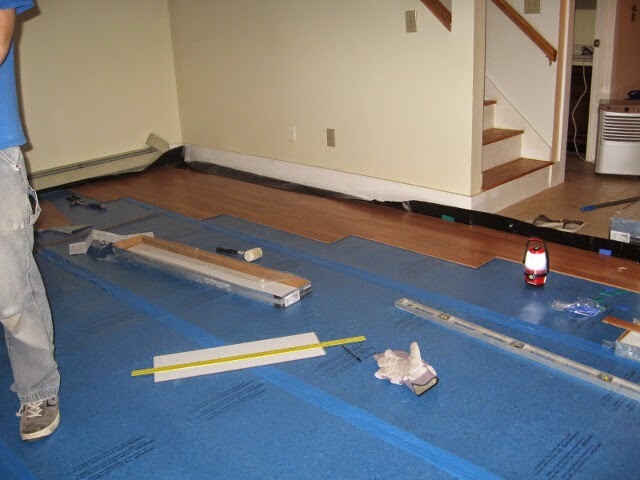 The cost of the underlayment was actually more per square foot than the laminate. Plus we had to order them in 100 ft rolls, and needed 306ft total.... so we paid $258 in underlayment, and just $206 for the floors. 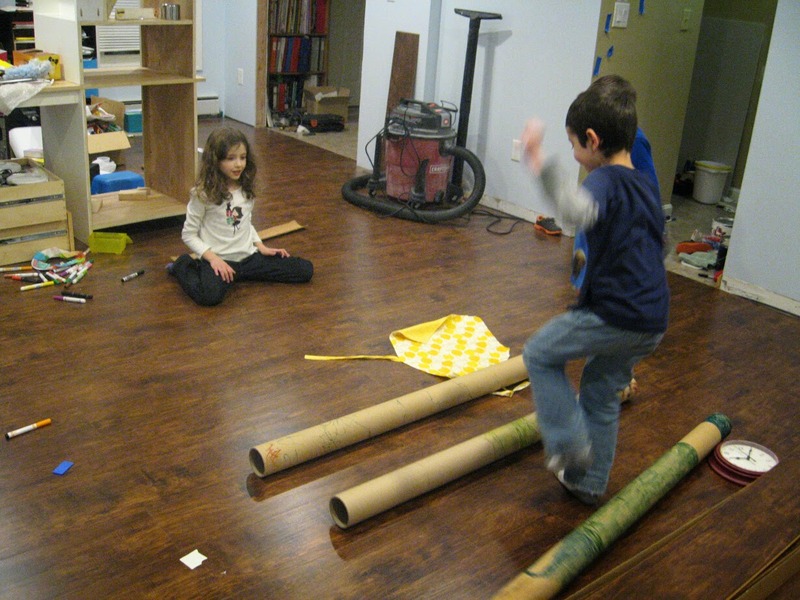 We ordered them from Lowes, and unlike other experiences, the shipping was incredibly fast. Faster than they predicted. Perfect, because we needed them here early if we were to make Eli's 'birthday present' deadline. Even just the cork alone was looking lovely on those dirty-white floors. We floated the installation and just duct taped the seams together, with just a few staples to hold the edges in place and flat. We decided to stop halfway through the room because we were running out of places to put stuff, and wanted to be able to at least let the kids use the play room. 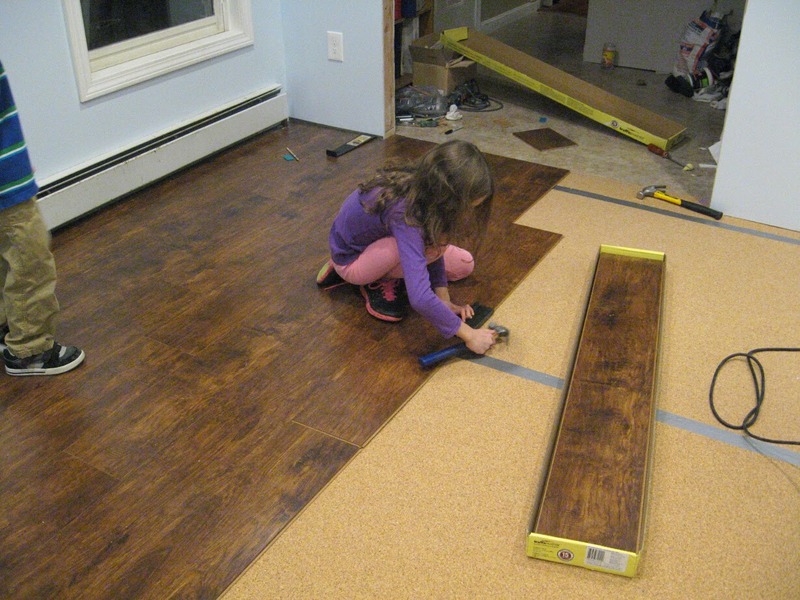 At this point it was super late at night, but we couldn't help but at least put the first few rows of flooring in. 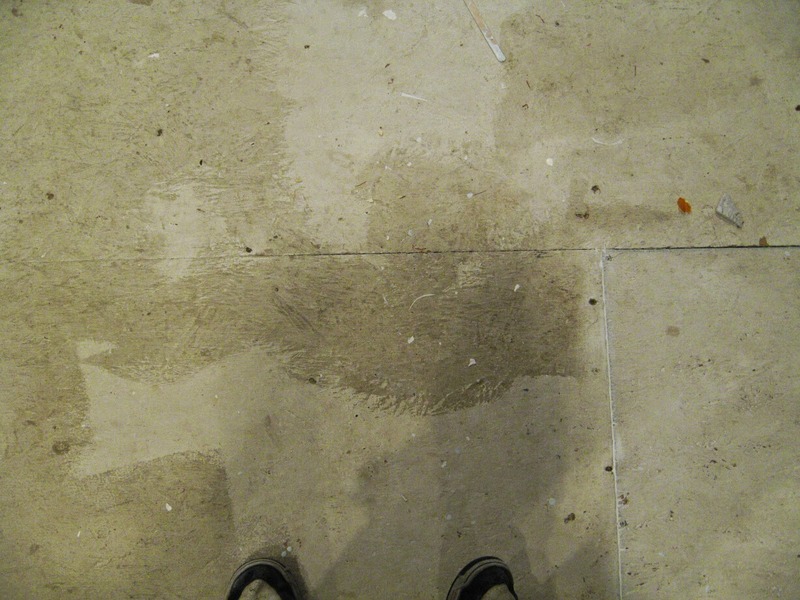 The next day, I came home early because I wanted to get to working on the floors. 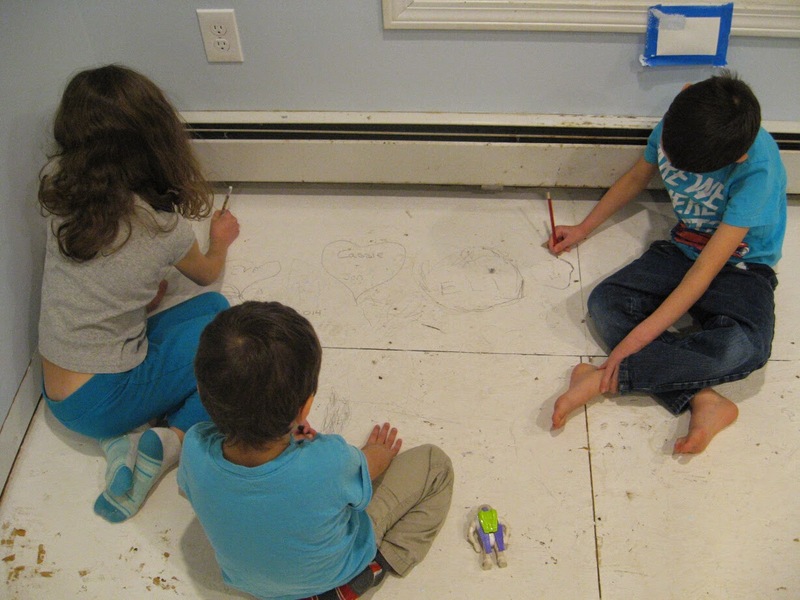 We gave each of the kids an opportunity to install floors, and they liked it so much, they helped most of the night. 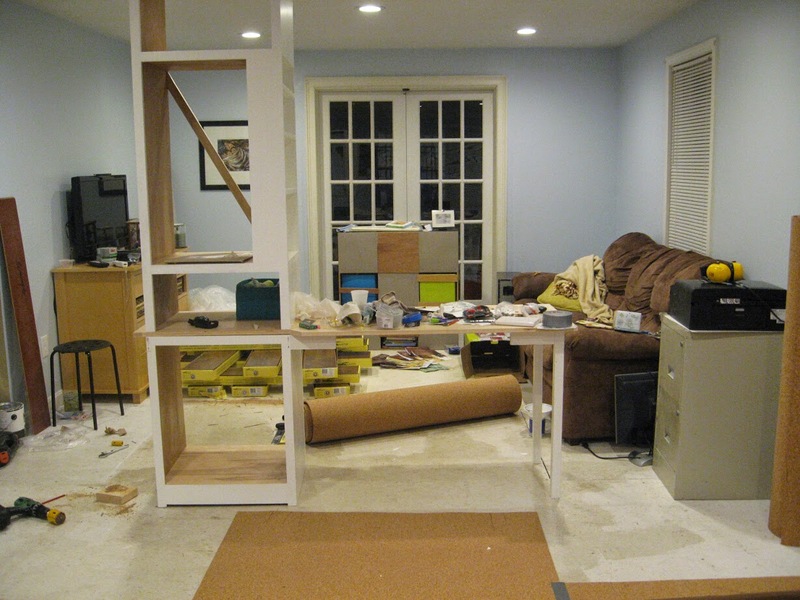 Once the first section of the floors was done we had to move the livingroom all over again. 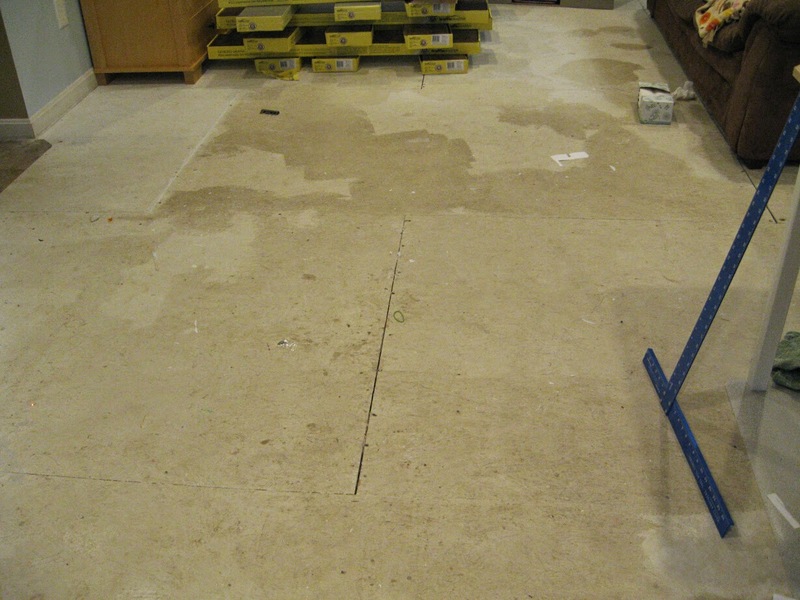 And then put in the rest of the underlayment. We couldn't get much further than this that night, so we called it quits. The next day Jon was able to finish 5 rows while I was at work, and when I came home I was kicking out rows like crazy. 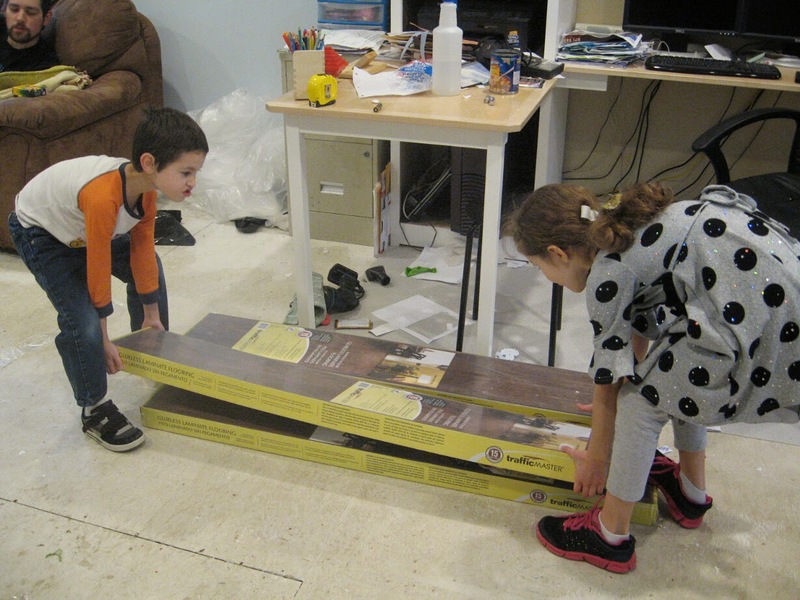 I let the kids help by handing me boards, but not installation (greatly increasing the speed). 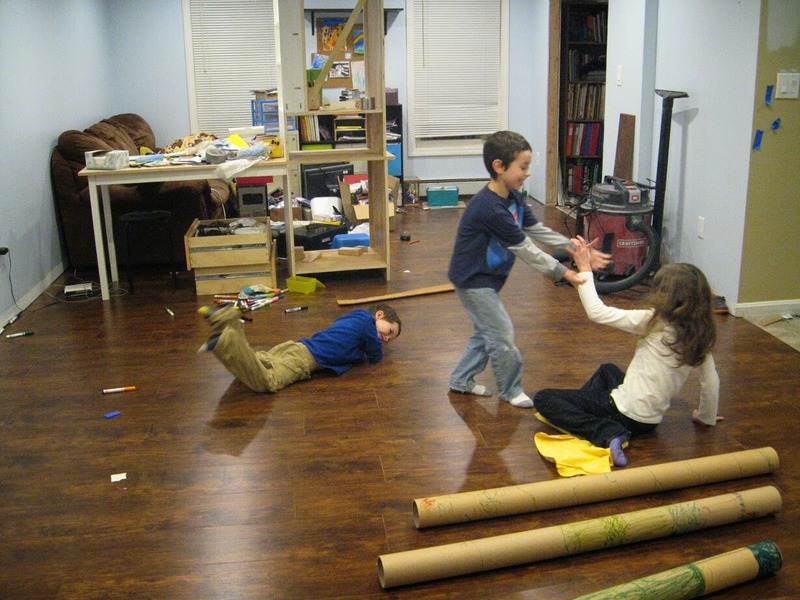 There was much rejoicing (crazy playing) when there was enough floor for them to play on. I still had about 8 more rows to do too. 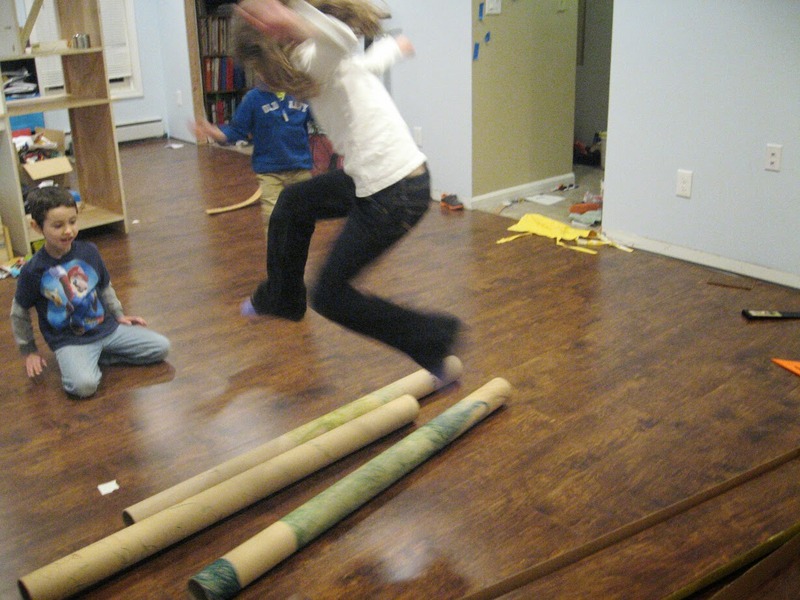 In case you're curious - Those tubes are decorated like people, and from the center of the cork underlayment rolls. Once all but the last half row was in we called it quits and got to our secondary goal. Putting up the Christmas tree! It was another late night, but we did it! Floors for Eli's birthday and floors for Christmas. And at this point, it's obligatory. Here's the the phase by phase. Feels a whole lot different in here, that's for sure. We're loving the office space we've carved out, with the desk, new monitors, table and the new wall. Having lights and a brighter paint has 100% completely changed the feel of the room. And the floor has made the room look finished. 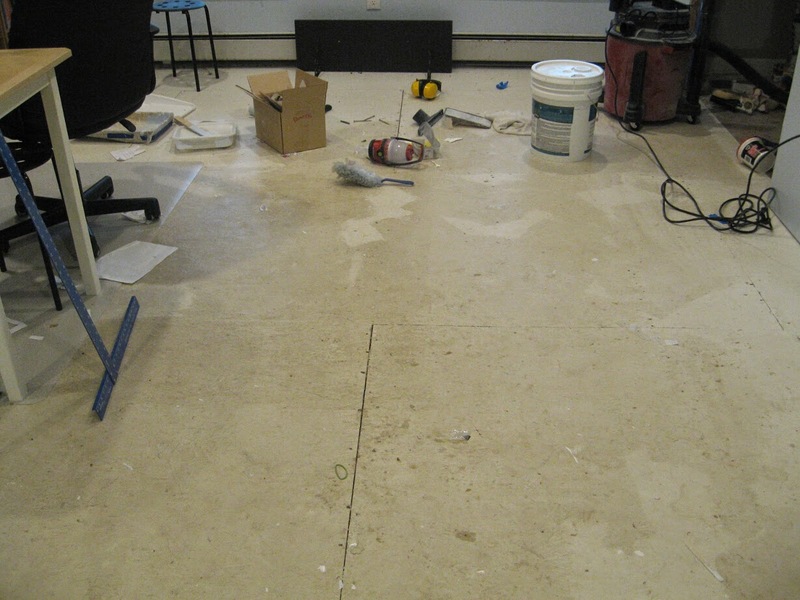 So as temporary as these floors are supposed to be, I'm so glad we decided to put them in. We still have some electrical work to do before we move the desk and bookcase back, but this is pretty darn close to being a construction-free zone! And that's what I want for Christmas!